2015 started off with a bang: my husband and I closed on a house the last week of December and spent the first two weeks of January packing and painting and planning our move. As of last week, we're officially residents of a new town, in a new county, about an hour west of where we used to live. We're loving it so far: great restaurants, incredibly nice people, and an awesome independent bookstore. Added bonus: most everything we could need is in walking distance, so we're trying things out as a one-car household for a while, to see if we can make that work. 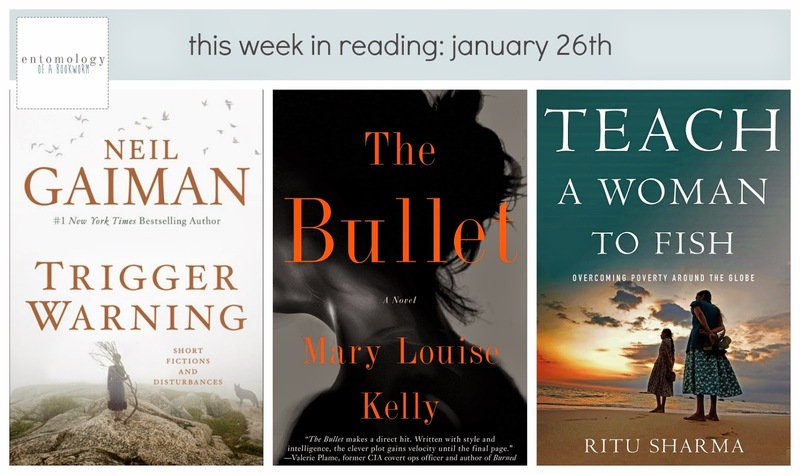 The Bullet, by Mary Louise Kelly: This is one of those read-in-one-sitting kinds of reads. I barely looked up once I started this story of a 37-year-old woman who has an x-ray only to discover she has a bullet lodged in her neck--and no memory of how it got there. Full review and author interview to come in Shelf Awareness in March. Teach a Woman to Fish: Overcoming Poverty Around the Globe, by Ritu Sharma: The aforementioned indie bookstore has a book club centered on women and their extraordinary series, and this is their pick for January; it's also right up my alley in terms of what I do for a living, so I can't wait to dive in. The Sharma book sounds right up my street as well. Teach a Woman to Fish sounds like the kind of book that needs to be read. Will have to add it to my to purchase list! Hope you have a great week! It's very good--hope you enjoy it if you do pick it up! It's the kind of book I want to underline. A lot. I will keep that in mind! I have an Audible credit I haven't decided how to use yet, so I might just try Ocean at the End of the Lane! I'm so excited for you and your new house! We did one car for the first few years we lived here and didn't have much trouble. Good luck with the unpacking! Thanks! I'm excited too... will be even more so when we get bookshelves built or purchased or something so I can unpack all these boxes of books and wonder why I kept so many books I'll never read, anyway. I'm reading Trigger Warning right now too! The story I read most recently, Truth Is a Cave in the Black Mountains, was prooooobably my favorite so far, but I've enjoyed almost all of them. It was so good! Fast-paced and addictive. I got to talk to the author this week as well and the story behind the story is just as fascinating. I just finished that one last night! I love the twisted way Gaiman's stories unfold, like you never know what's coming--on any level--until it hits you in the face, and then it's like, of course that was where this was going.